With his customary cynicism, Fred Inglis claims that the Manifesto groups only achievement was to help ‘in a tiny way’ Labour’s defeat in 1970. This is not true. The Manifesto groups and the New Left in general had been right to try to harness the activism and enthusiasm that was emerging in the 1960s and to hammer out a political strategy to the left of Labour and independent of the Stalinists.The fact that leading figures on the left were publicly rethinking old positions and openly looking for new ways to organise could only be positive. The problem was not the initiative itself, but the leading figures’ conception of the movement. It was a time of growing activism, thousands were marching for civil rights in the US and Ireland, and against the bomb and the Vietnam War in Britain. In France student action had detonated a semi-insurrectionary general strike. And there were stirrings amongst British workers too. Indignation at Labour’s attempts to increase productivity and to aid the employers offensive had been growing for years. In 1966 seamen went on official strike and Wilson turned the strike into a test of strength with the unions. In 1968 miners lobbying the Labour conference burst into the conference hall carrying banners reading ‘Halt pit closures now before it is too late’. By the end of the l960s large sections of workers were in open revolt against local productivity deals and the national incomes policy. In 1969 the CP called a national one day stoppage to lobby the TUC which was followed by a quarter of a million workers. Fords workers struck for higher wages and miners went out on unofficial strike against a national productivity deal signed in 1966. Workers’ grudging loyalty to Labour, traditionally brokered by the trade union leaders, was showing signs of strain. The modest but significant growth of the revolutionary groups showed there was an important audience for genuine socialist ideas. The New Left reflected this wave of activism, but because they didn’t base themselves on it, or try and develop it, their deliberations were often dry and unnattractive to many newly radicalized young people. Debates about how to reinvigorate Labour or whether to stand parliamentary candidates didn’t appeal to the most militant students fresh from demonstrations or the most political workers smarting under attacks from the Labour Government and looking for ways to build resistance. Worse still, the New Left combined an obsession with debate with a toleration of fudge and false unity. Fred Inglis, along with many of William’s admirers, sees William’s powers of conciliation as one of his great strengths. Williams was the movement’s favourite chair because of his ‘ability to see and seize what unites factions rather than divides them and to insist upon this unity before the conference terminates.’ Despite the initial enthusiasm and excitement, the end result was a movement with a vague attitude towards practical action and little or no theoretical clarity. It is little wonder that its only achievement was the creation of a journal of theoretical discussion, the New Left Review. In his hilarious dissection of the New Left, Peter Sedgwick blames its shortcomings on its class basis. The movement represented ‘the false consciousness of the middle class meritocracy’ the politics of ‘the professionalised radical (who) appoints himself as observer and dispenser to society’. But there was also a connected theoretical dimension. A number of critics have noted Williams’ tendency to believe you can bring about change by just arguing for it. Lin Chun for example, points out that the May Day Manifesto, for all its radical vision ‘failed to investigate the way to get there, especially in terms of the obstacles.’ But the recent discussions of Williams in the New Left Review seem to regard this as a minor problem, or even at times a source of strength. In fact the question of agency, of how to achieve change, which is always skated over in Williams’ work, must be fundamental to any serious socialist theory. The academic gurus of the New Left, among them Thompson, Williams and Hall were all searching in their different ways for a socialist politics which rescued human agency from the mechanical determinism of Stalinism. The problem was, in the course of rejecting Stalinist distortions, they tended to undermine a key Marxist concept. They all continued to talk about the workers, but lost sight of the economic factors which underpin their position as the revolutionary agent of change. 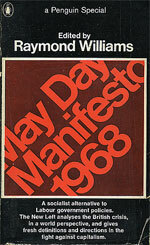 The original May Day Manifesto was published in 1967. For its publication by Penguin, it has been revised, developed and extended, to about twice its previous length. In this preface, I want to explain, briefly, how and why it was written, and why it is now being offered to a wider public. In the summer of 1966, a group of socialists met to discuss the possibility of a political intervention. They had no official positions in politics; they were mainly teachers, writers and research workers, the majority from the universities. Nor did they belong to any constituted group, though again a majority of them had been associated, at different times over the previous ten years, with what is usually described as the New Left. work, but it soon ~ecame apparent tha~lough much useful material existed, it was more than a matter of putting it together; indeed at certain critical points of connexion it had all to be reworked. The original group was extended, through succesive drafts, and finally, with money subscribed in small sums by members of the group, the Manifesto was privately published and distributed. The response was so considerable that it had to be reprinted several times, and we were overwhelmed by letters and requests for speakers. From many other countries, also, we received letters and comments, and the Manifesto has been translated, in whole or in part, into several languages. Political decisions followed from this, and are discussed in this new version. But also, the necessary process of intellectual work, developing the Manifesto’s analysis, was continued. The group, now considerably enlarged, set up specialist working groups, and a new editor and editorial committee. The present version is the result of that extended study and discussion, and takes into account all the other discussions, in meetings in different parts of the country, which followed the original publication. This is the internal history of the Manifesto, and it is worth recording because the fact of a self-organizing, self-financed socialist intellectual organization is important: not only against misrepresentation, which is always probable in politics; but also as a specific kind of achievement. What has then to be described is its wider dimension. This Manifesto is, we believe, the first connected and closely argued statement of socialist views in the very specific and changing Britain and world of the sixties. As such, it ought obviously to get the widest public attention and discussion. The original version was described in the Sunday Times as ‘certainly the longest, most carefully thought-out statement to come from the Left for several years’, and in Le Monde as ‘distinguished by the rigour of the analyses presented, the lucidity of the judgements made on contemporary Britain, the realism of its proposals’. But for reasons which will become clear in our actual analysis, acknowledgements of this kind, which we were not looking for, are very different from what we are really interested in: the effective introduction, into political argument and activity in Britain, of a contemporary socialist case. That is what we meant, originally, by a political intervention: for though socialism survives, as an idea, and socialist activity goes on, in different minority areas, it has been a main effect of the existing political, economic and cultural system that the substance of socialism is continually bypassed, deflected, or, as in the case of the present Labour government, reinterpreted until it has lost all meaning. It is not at all a question of preserving some holy writ or some original sacred doctrine; we are ourselves very critical of much past socialist analysis, and we believe that Left institutions, in failing to change, have exposed themselves to containment or defeat. That was always the sense of the description ‘New Left’, but we were more successful, in certain books, journals and essays, in communicating a new current of thought, which has indeed been widely recognized, than in finding the self-sustaining institutions, the widening contacts, the effective confrontation with official politics, which were so urgently needed. By the publication of this Manifesto – indeed by calling it a manifesto, and making it that kind of challenge – the New Left, which had continued throughout as a movement of writers and thinkers, and which in the early sixties had attempted new local kinds of political organization, was at once reconstituting and changing itself. We have no particular attachment to the name; it is mainly what others have called us, and it has become known: in Britain through certain books and journals; in the United States, where we had contact in the beginning with a newly active generation, through a wide movement. The bearings of what can be called a New Left analysis on political organization in Britain are discussed, in detail in the Manifesto, and need not be anticipated here. But it is worth saying that what we are attempting is not a revival of ‘the New Left’, considered as some specific organization which it has never really been, but a development of what we are content to call the New Left emphasis, which has continued throughout, in specific work, but which in the present crisis leads necessarily to a different kind of political manifestation. We present this Manifesto, therefore, not as an internal document, but as a public statement and challenge. It does not complete our work, but begins a new phase. It is intended to have not only theoretical but practical consequences. We expect and shall welcome considerable agreement. At the same time we not only expect opposition, but demand it: this is an argument, right in the open, that has been delayed too long, and that now must take place, with as many people as possible joining in. All the work that has gone into the Manifesto, all the expenses involved in the original publication, in research and in meetings, have been voluntarily given. The people involved are not looking for political careers, and have no established interest or party. In the one identity that they have, as intellectual socialists working in universities, technical colleges, schools and research institutions, they find also their purpose: to present, to clarify and to continue the widest kind of political argument; and to accept, in the urgency and seriousness of the present crisis, a responsibility and a commitment to all the actions to which the argument leads. They are experienced already, in many different ways, in the practical work of politics: as active members of existing parties and campaigns. But now they put this first: to bring the theory and the practice together, and so to meet new people and to begin new activity.